Until now, if you were looking for spicy stuff at a fast-food joint, your best bet was either to go to Five Guys and get a burger with jalapeños, or go anywhere and bring some pure Trinidad Moruga Scorpion extract. 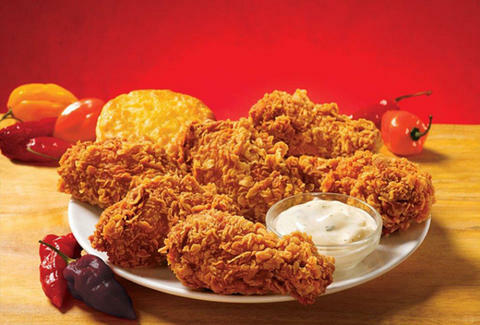 But up until January 25th, Popeyes will be serving a brand-new menu item containing the world's third hottest pepper: GHOST PEPPER WINGS. The chicken wings are first marinated in an "exotic blend of peppers" -- one of which, duh, is the bhut jolokia or "ghost pepper", which clocks in at 1,041,427 Scoville units (for reference, a jalapeño only has around 10,000) -- for 12 hours, and then go through the typical Popeyes crispy chicken treatment: being battered, breaded, and deep-fried. They're available in orders of six with a biscuit and buttermilk ranch dipping sauce. Though if the pepper they're made with is any indication of their spiciness, you might need to bring a gallon of milk. Adam Lapetina is a Food/Drink staff writer for Thrillist, and recommends eating these wings rather than trying a raw ghost pepper. Read his musings at @adamlapetina.